As a result of the 25-year-long civil war in Sri Lanka, the Tamil people had to evacuate the country and consequently are currently spread across the world, with a particularly large and vibrant community in the United Kingdom. The British Tamil population today is made up of those with both Indian and Sri Lankan origins. It is two-lakh-strong, with the majority being second-generation British Tamils who were born to immigrant parents and identify themselves as British — except when the time comes to plan their weddings. “In my experience, I have met two types of Tamil brides,” says Visvendra. “There’s the bride who speaks the mother tongue and is generally aware of traditional practices and is up to date with Tamilian pop culture. Then there’s the bride who is more disconnected. For the latter, wearing a sari and looking non-Western is quite new. You ask them to wear a white dress, they’d do it in a heartbeat and look amazing, but you ask them to wear a sari, they wouldn’t even know where to begin.” Visvendra also recalls how she’s encountered several unsure mothers and aunts who came up to her to ask about bridal customs, from the way the hair is braided to whether the bride ought to be wearing a nose ring. This distance from tradition also means that the beauty aesthetic that British Tamil brides adhere to is heavily influenced by the environment they grew up in. “Bridal styling in the UK is definitely inspired by the global mainstream make-up trends and the internet,” says Ratnaselvam. “These are often reinterpretations of modern party looks and celebrity style. For example, the smoky lower lash line of Kim Kardashian, fluttery eyelashes sold by Huda (Kattan) Beauty and the strong winged eyeliner popularised by social media influencers are all heavily incorporated into the final look.” However, there are also the brides who watch Tamil films and come to Visvendra to recreate looks from Kollywood (the Tamil film industry). When compared with their simpler counterparts in the Subcontinent, the British Tamil brides’ looks are far more dramatic — bold eyeliner with metallic shadow, big lashes, voluminous hair and saris that are draped to hug the figure like a tight dress are common features. 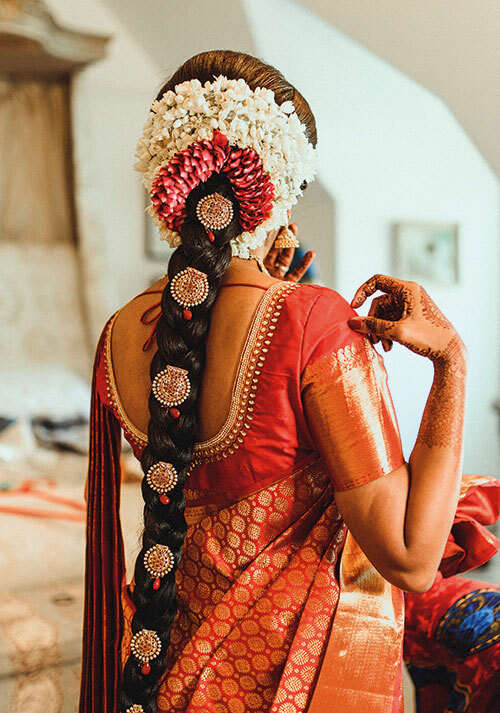 “Although brides may have a modern approach to their make-up, most of them will still want that pure kanjivaram sari (traditionally woven silk sari from Kanchipuram), temple jewellery and the long plait or bun. Some even wear their mother’s jewellery for sentimental reasons,” says Ratnaselvam. Ratnaselvam says that many of her clients use their wedding as an opportunity to make a trip to India, usually Chennai or Kochi, to shop. 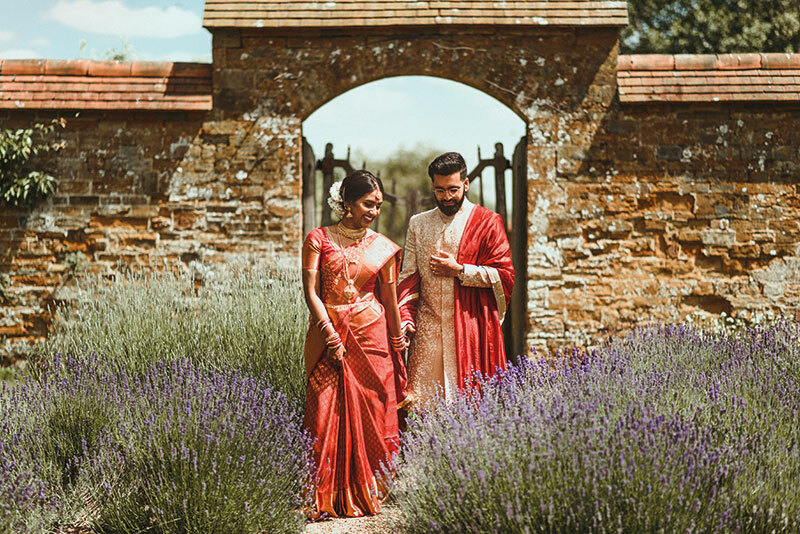 “They want to know the latest sari styles, which I think is lovely and part of staying connected to their roots.” Social media manager Kavya Rajagopalan is one such bride. “I always knew that I simply had to do my wedding shopping in India,” she says. 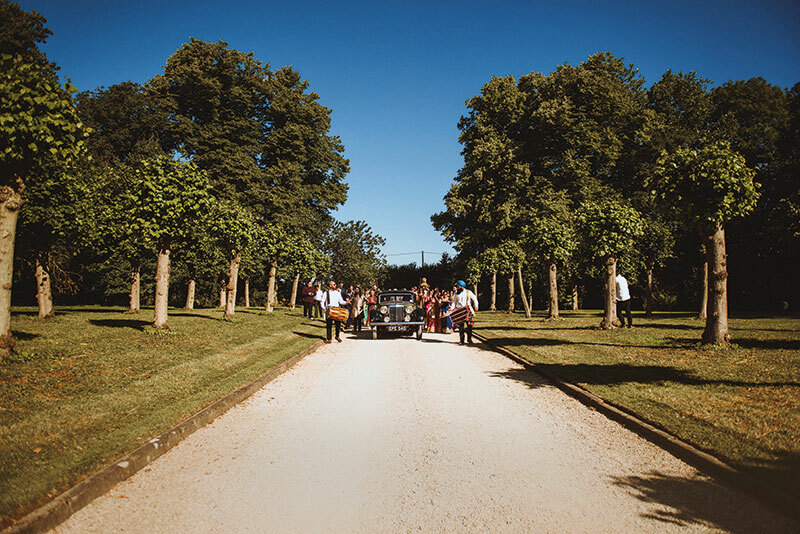 “There are plenty of amazing retailers here in the UK where I could find stunning saris, but there’s something about that buzz, the chaat stops between shops, and the sheer variety in India that I just had to experience for myself!” Kavya married her Gujarati fiancé in the English countryside, in a gorgeous venue called Poundon House in a hamlet near Bicester. They had an outdoor wedding where the rituals were predominantly Tamil, except for the baaraat (a procession of the groom’s family and friends) with a traditional Gujarati welcome and the groom tying a mangalsutra (a necklace worn by a Gujarati woman to signify that she is married) as well as a thali — a decision they arrived at after involving and seeking the guidance of both sets of parents. Rajagopalan’s mixed community wedding also meant that she only had one sari that she wore throughout the ceremony: a stunning red kanjivaram. “Even though I was marrying a Gujarati,” Kavya says, “I knew that the one thing I wanted was to look like a Tamil bride! I think I’ve always wanted to wear a pattu (silk) sari — the first weddings I went to were South Indian ones.” Rajagopalan, who was born and raised in London, has studied Tamil and is trained in both Bharatanatyam and Carnatic music. She reiterates that having the Tamil rituals and looking like a traditional bride were important to her because a large part of her identity is tied to her heritage. “For me, it meant a lot. 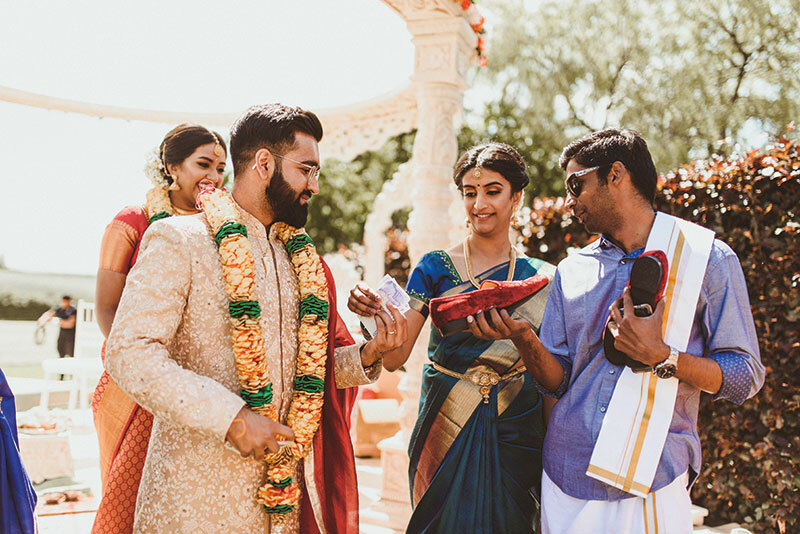 The wedding introduced my culture, roots and traditions to my husband Rikesh and my in-laws in the best way possible,” she says. 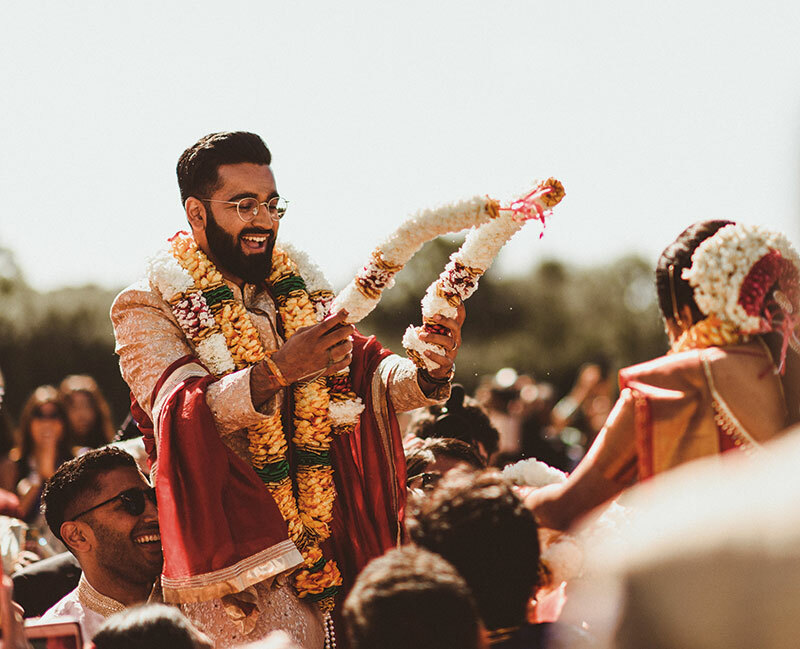 For the Tamil diaspora in the UK, these evocative weddings bring a typically suppressed identity to the forefront and are therefore, more than just a celebration of love — they are also a homecoming.